The REO BM175-10PT Sequential Blasting Machine is a modern easy-to-use programmable timing machine meeting the special requirements of bench blasting operations where precise millisecond/microsecond accuracy is critical. Programmable timing permits the blaster to take full advantage of the greater accuracies offered by the new electric detonators to achieve better fragmentation and to control ground vibration. The REO Sequential Blasting Machine allows the blaster to continue full production blasting which otherwise would be drastically curtailed if a single circuit machine were employed. This blasting machine is of solid-state capacitor-discharge design with 10 output (cap) circuits. The REO PT Blasting Machine fires the cap circuits one after the other sequentially at pre-selected time intervals for 1 to 999 milliseconds in 1 millisecond increments. For special requirements, timing selection increments of 100 microseconds to 10 milliseconds is offered. The BM175 Blasting Machine is a 450 volt output model. 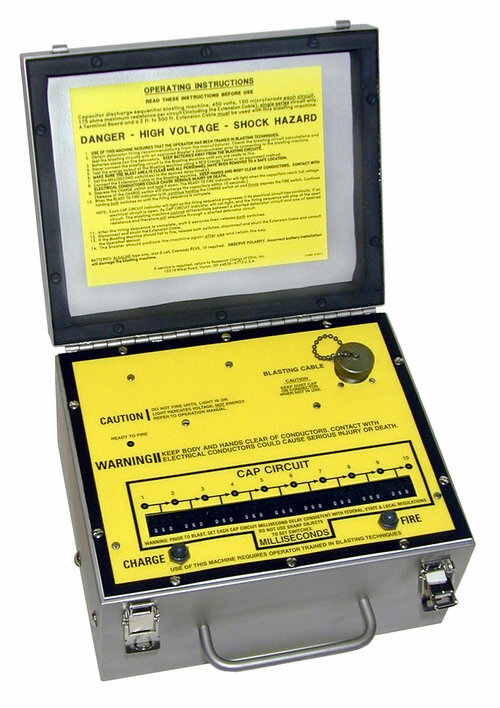 This model has a cable receptacle on the top panel and requires an EC15 series Extension Cable and TB15 Terminal Board to connect to the detonator lead lines. The timing intervals between circuits are selected and set independently on each of nine switches, and the selected timing may be DIFFERENT between each circuit. The machine is available with a TRIGGER OUTPUT that provides an optically isolated output when circuit 1 fires. This machine has a KEY feature. Permits initiating larger blasts while meeting stringent blasting regulations. Helps control vibration and noise. Improves fragmentation through accurate or improved delay blasting. Choice of any MS interval from 1 MS to 999 MS in 1 MS increments. Microsecond timing is available on special order. Reliable. Blasting machine will not fire or discharge until fully charged to design voltage. Safety interlock. "Charge" and "Fire" switches must both be depressed for the blasting machine to fire. Blasting machine is rendered inactive when switches are released. Sturdy construction for extended life. Rugged water and corrosion resistant stainless steel case. Environmentally sealed to operate in most weather. Solid state circuitry assures excellent reliability and service life. Heavy-duty, long life ALKALINE batteries provide efficient and expandable power. Fast battery change using readily available standard ALKALINE batteries. No special tools are required. Temperature compensated circuits facilitate cold weather operation. Use of this equipment requires training in sequential blasting techniques. Contact your powder company representative for training information. This equipment must be operated in accordance with US Federal health and safety standards, state laws, rules and other applicable statutory provisions. SUITABILITY: Properly trained and skilled personnel must determine suitability and safety factors of each blast. IMPORTANT: Devices such as the REO Blasting Machine Energy Testers must be used to determine the energy output of each circuit prior to each blast. The extension cable shall not be connected to the blasting machine until the circuit wiring has been verified by approved testers, the blast is ready to be fired and area safety is assured. After the blasting circuits have been connected to the blasting machine, depress the CHARGE switch and hold it down. When the READY TO FIRE indicator lights, depress the FIRE switch while continuing to depress the CHARGE switch. Unless the CHARGE and FIRE switches are operated together, the machine will not fire. The CAP CIRCUIT indicators, when lit, indicate the probability that a circuit fired. The machine will stop firing at an open circuit, except -BOC series Blasting Machines which continue sequencing even if a circuit is open. CAUTION: WITH THIS MACHINE, AS WITH ALL BLASTING EQUIPMENT, STANDARD SAFETY RULES SHOULD BE FOLLOWED WHICH INCLUDE THESE: KEEP BLAST AREA CLEAR OF UNAUTHORIZED PERSONNEL, KEEP BODY AND HANDS AWAY FROM CONDUCTORS AND USE ONLY APPROVED TEST EQUIPMENT. A lighted READY TO FIRE indicator confirms that the battery power was sufficient to charge the capacitors to the design voltage and the safety circuit is released. The amount of time it takes for the READY TO FIRE indicator light to illuminate reflects remaining battery life. After months of use, a longer charge time will be required. However, regardless of battery condition, the full design voltage is present and the unit's safety circuit is released if the READY TO FIRE indicator is illuminated. Blasting machine cannot be fired until the design voltage is verified and the safety circuit is released. Case is sealed against moisture and dust. Capacitors are shunted until the "Charge" switch is depressed. Blasting circuits are shunted until the "Fire" switch is depressed. Cable receptacle is protected by the cover. Circuit only 20.2 lbs. (2 kg.) 6.8 x 12.5 x 11.8 in. 1. A receptacle is provided to accommodate an extension cable and TB15 Terminal Board. 2. 12 ohm maximum lead line and 2 ohm EB detonators wired in a single series circuit, based on U.S. standard detonator rating of 20 millijoules/ohm delivered in 5 milliseconds. Contact your powder company for recommendations. See SUITABILITY statement under OPERATION heading.